A notice to Blackwood residents. On Friday May 24, 12 to 4pm, Saturday 25 from 9am -5pm and Sunday May 26, 9am to 1pm we (VERi- Vintage Enduro Riders Inc.) are holding a Vintage Enduro in the area – the Australian 3 Day Vintage Enduro (A3VE). On Friday we are starting at the Crown Recreation Reserve and doing 2 60k loops towards the Daylesford Road, the back of Dales Creek and Ballan North. Riders will be active travelling through town from 10am – 12 noon, in and out 1 -3pm and finally in about 4-5pm. On Saturday we are starting at the Crown Recreation Reserve and doing 2 x 60k loops up towards Trentham and back on forest roads. Riders will be active 9-10am, in and out 11am-12 noon and back in 4-5pm. Sunday a loop towards Trentham and one over to Ballan North and back. Riders will be active 9-10am, in and out 11am–12 noon. Riders will be leaving three per minute and following a marked course with coloured arrows on a white background. (All evidence of our passing will be gone by the Tuesday after the event). I’d estimate 80 entrants from past event attendance. 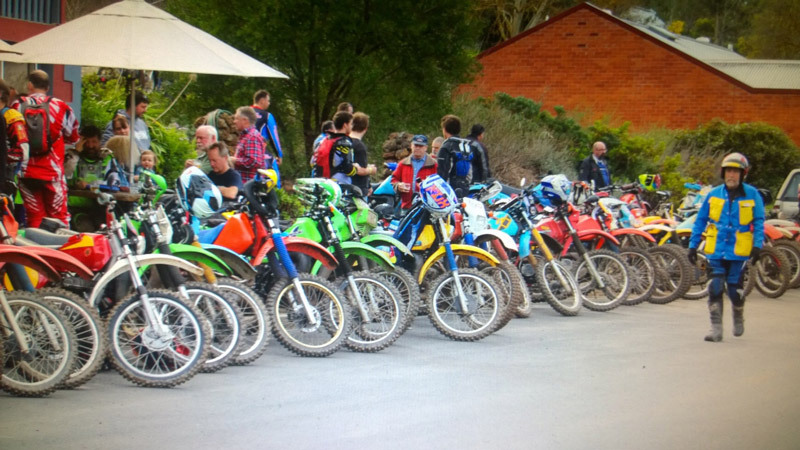 We are ‘mature age’ riders with registered trailbikes who regularly conduct non-competitive events throughout Victoria. We aim to recreate the enduros of the 1970s and 1980s with checkpoints, route checks and special tests. We will be using private land for Special Tests (a BIG thank you to Geoff Wilson at Mere Farm, Barry and Gerard Mullane at Bunding and Steve Burgin at Greendale) for the competitive riders to be tested while other riders can simply ride the set course. We restore and ride pre-1988 trailbikes and the aim of the event is to treat it all as a bit of fun, no stress. Just the simple satisfaction of completing the course is usually enough. We have DELWP permission to use the forest tracks, a Motorcycling Australia Permit #1112 with the attendant $40M Insurance coverage for all landowners and third parties, we have our own Paramedic and Ambulance in attendance, we have provided a traffic management plan to the Ballan and Trentham Police, we have the backing of the Blackwood Crown Reserves Committee, the Special School camp, the Blackwood Hotel, the Martin St Post Office and Martin St Café, the Blackwood Progress Association and the Caravan Park and as we are a non profit organisation we donate to local organisations. As the secretary of VERi and a resident for 5 years I know the issues with noisy trail bike riders and Harley riders. Rest assured, our disruption will be minimal and I want the entrants to see what a great little town we have. I am so pleased with the positive attitude everyone has shown us in the planning stage and rest assured, we will be doing our best to be asked back.